Akt Kinase Activity Assay Kit (ab139436) is a non-radioactive assay providing a safe, rapid and reliable method for the screening of inhibitors or activators of Akt and for quantitating the activity of Akt in purified or partially purified enzyme preparations. This kit is based on a solid phase enzyme-linked immuno-absorbent assay (ELISA) that utilizes a specific synthetic peptide as a substrate for Akt and a polyclonal antibody that recognizes the phosphorylated form of the substrate. The assay is designed for the analysis of Akt activity in the solution phase. For the measurement of Akt in partially purified and purified enzyme preparations from any species. AKT, also known as protein kinase B (PKB), is a serine/threonine protein kinase. There are three mammalian isoforms of AKT: AKT1 (PKB alpha), AKT2 (PKB beta) and AKT3 (PKB gamma) with AKT2 and AKT3 being approximately 82% identical with the AKT1 isoform. Each isoform has a pleckstrin homology (PH) domain, a kinase domain and a carboxy terminal regulatory domain. AKT was originally cloned from the retrovirus AKT8, and is a key regulator of many signal transduction pathways. Its tight control over cell proliferation and cell viability are manifold; overexpression or inappropriate activation of AKT has been seen in many types of cancer. 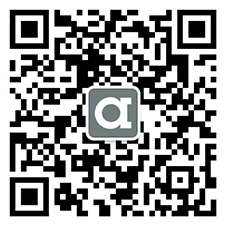 AKT mediates many of the downstream events of phosphatidylinositol 3 kinase (a lipid kinase activated by growth factors, cytokines and insulin). PI3 kinase recruits AKT to the membrane, where it is activated by PDK1 phosphorylation. Once phosphorylated, AKT dissociates from the membrane and phosphorylates targets in the cytoplasm and the cell nucleus. AKT has two main roles: (i) inhibition of apoptosis; (ii) promotion of proliferation. AKT has been shown to play a role in such metabolic processes as glucose transport, glycogen synthesis, glycolysis, and protein synthesis. It had also been shown to promote cell survival by inhibiting apoptosis through its ability to phosphoylate and inactivate several targets, including Bad, Forkhead transcription factors, and caspase 9. Activity of AKT has been associated with the phosphorylation of two sites: T308, in the activation loop of the kinase, and S473, at the carboxyl terminus. Phosphorylation of both sites contributes to AKT activity, however phosphorylation of T308 has been shown to be absolutely essential for AKT activation. Cell Membrane, Cytoplasmic and Nuclear. Note=Nucleus after activation by integrin-linked protein kinase 1 (ILK1). Analysis of purified active Akt activity with ab139436. Varying quantities of purified active Akt were assayed using the Akt substrate microtiter plate. Assays were incubated for 60 minutes at 30°C. Akt Kinase Activity Assay Kit, ab139436 - which AKT activity is detected? All AKT (1,2 and 3) or just AKT1 activity? 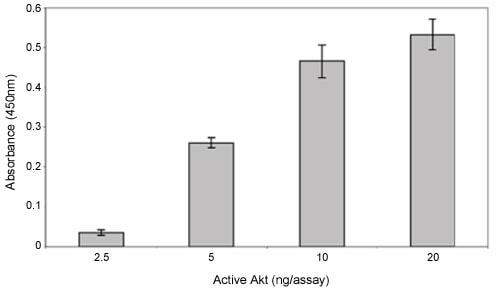 The AKT activity assay ab139436 measures activity of all three AKT, 1, 2, and 3.